Red Dot Design Award: zeitzeugen-portal.deErzählen. Erinnern. Entdecken. The Zeitzeugenportal (Contemporary Witness Portal) website presents a collection of video interviews conducted with contemporary witnesses of German history, inviting visitors to discover, research and analyse individual narratives and accounts of the past. Following a clear arrangement and structure, the site places these people centre stage. Shown almost in full format, they seem to be looking straight at the website visitor when they open the page. Browsing the menu items of “Periods”, “Themes” and “People”, users are presented with specific time periods when scrolling, as well as with familiar faces from politics, culture and society. 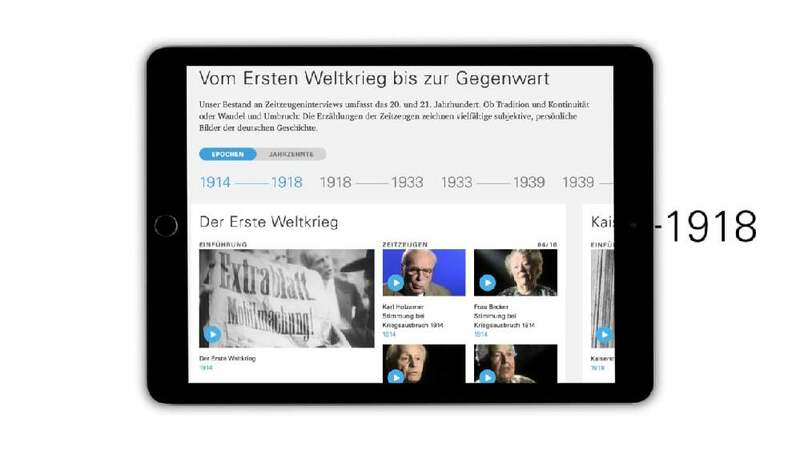 Constantly updated and expanded by the Haus der Geschichte der Bundesrepublik Deutschland Foundation, the portal currently features around 1,000 interviews in more than 8,000 clips. Aimed at a broad target group of people interested in history, it acknowledges and responds to the growing significance of interviews with contemporary witnesses. Spearheaded by individual accounts of everyday experiences covering different angles, German history is thus conveyed in a realistic and engaging manner. This project is outstanding. Reflecting the high journalistic quality of the excellently conducted interviews with important contemporary witnesses, the related website has emerged as a huge platform of knowledge and relevant content. The portal not only represents a fantastic example in terms of online education, it also assumes a democratic function. The clear and intuitive-to-browse design lends the website a high aesthetic appeal.